I had problem yesterday while logging into my windows 7 account. I can login with the username and password but it shows nothing on my account. It is similar to new profile. While searching for solution, I found out that it is logging with temporary profile and this is the problem sometime happens with windows 7. To resolve the issues, there are solutions which says to backup the folder of account profile and create new profile. But that is not the proper solution as per me. As you need to do many things and invest time into that. The best solutions found is Reprofiler. 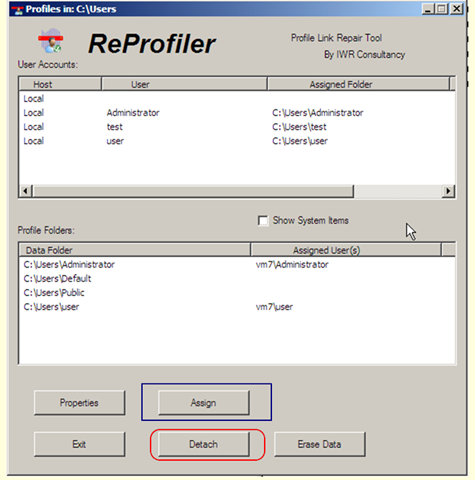 With this tool, you can map the profile with correct username. In my case, I have detached the profile first, then restart the computer. Then I logged in as another user (which is admin). Then I have again assign the profile to the username using this tool and it worked!! !